Nguluni is a small town east of Nairobi. It is open grassland, very dry and short of water. Many of the people are very poor and resort to collecting ground water for their needs. By the end of the dry season only mud is left in the pools, the water is contaminated, crops have often failed and the people are even more hungry. Like many parts of Kenya, HIV/AIDS is rampant. Many schools are substandard. Because of the urban sprawl from Nairobi, wealthy people are buying large tracts of land in the area and building homes. This is changing the demographics of Nguluni. In the past, many of those who lived there had few options about where they lived and there was widespread poverty. These were the conditions that Robert and Rose Gitau found when they arrived to begin to plant a church in the area. During the early stages of developing the church they realised the many needs of the community. They formed their church not only to be a place of teaching and worship but created it to be a place of holistic ministry. Robert and Rose began identifying the greatest needs and immediately worked to meet them. These included the development of a school, a new borehole, a health clinic, job creation programmes and a church. They are very compassionate and felt a heavy burden for the people in their community. Despite the challenges they faced, Robert and Rose were hopeful that there would be long term transformation in many lives and families and in the whole community. BHW first visited in 2002 and soon after began to partner with this ministry. The partnership began by assisting with the salaries of the teachers and the needs of the boarders. A micro-enterprise fund to assist people to get ahead and develop self-sustaining lives was also commenced. 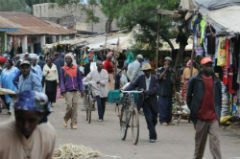 The micro-loan programme grew and was shifted to Nairobi (KEN03c). The school grew and over time other small developments occurred; a fish pond was developed and a greenhouse for growing vegetables was built (KEN03d). The clinic grew and a full time medical staff member was brought in. The one main church planted other smaller churches in surrounding communities. More and larger buildings were added to house the boarders during the school term. Over time the needs also grew. A series of bad harvests caused even greater poverty and more young people and children were not going to school. There was pressure to keep adding more and more students until they found themselves overstretched. As a result, more leaders were brought in and the whole ministry was restructured. One outlying school was closed and the small secondary school was also closed. As the restructuring commenced in 2014, Rose died, leaving Robert to carry the burden and lead the transition. Both Robert and Rose had a lot of faith and a deep love for children, so it was always hard to say no to the needs. The process of restructuring contributes to this being a much more sustainable work in the long term. There are a number of beneficiaries including the children and families of the local community who come to the church and to the school. A number of poor children without families also benefit from the home the church provides. Many local poor people also benefit from having this ministry in the area. They have access to a clinic and to clean water from the school site. We love this partnership because of the quality of Christian love the children are receiving. Robert is chaplain to the school and pastor in the church. He is frequently at the school, talking to the children about Jesus, playing games and leading Bible studies. Robert has a vitality of life and genuine love for the children that is very obvious. Leaders are being developed now and taking up roles within the programme. 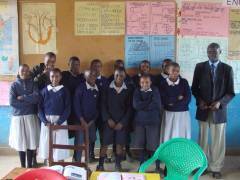 Muthui heads up the Board that now governs the school. He is married to Hannah. They have two children and live in Kimathi, Nairobi. 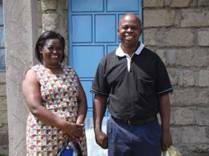 Muthui is the Pastor of Kimathi Chapel and Director of a number of schools run by the FOB churches. He trained in Zambia in the mid 1980's and has both passion and experience in assisting people. He also oversees the FOB Revolving Fund micro-loan programme (KEN03c). Isaac saw Robert and Rose as his surrogate parents and thanks God for their involvement in his life. He would not have been able to get married without the financial support of Robert and Rose. Getting married in Africa is a costly affair and with this expense they used up their savings which has prevented them achieving their goal of returning to Congo for further study. Isaac is heavily involved in the church with Robert and other leaders and is passionate about sharing the message of Christ. One of the things he enjoys about living in Kenya is that he has the opportunity and time to share the gospel. In Congo there is not this opportunity to do so due to all the fighting and war. Isaac also plays music in the churches and was previously teaching music at the school. He is in charge of the clinic as the medical officer and since Rose's death has taken on a further role as the treasurer of the school. Isaac was born in the DRC and had to flee after racial tensions erupted into war and the destruction of Nyakunde Mission Station in 2003. His brother was killed during the massacre. Since coming to Kenya his life has changed greatly and he has become an integral part of the leadership team. The vision is to provide schooling for children so they get access to education. 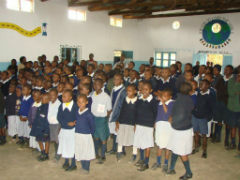 In the process of this they hope the children will discover salvation in Jesus Christ and become good citizens of Kenya. Their strategy is to provide good quality education by hiring teachers who are capable of teaching well. Quality is important to them. This sees about 200 children in school, about 50 in preschool and about 70 boarding in hostels. The financial support from BHW is not the only income the school has, some of the children pay fees and there are other irregular donors. There are hundreds of stories of life change. Four of the teachers in the school are Robert and Rose's 'children'. Others are living all over the world and many are in Christian ministry. Some are lawyers and accountants and they frequently come back home. Joyce has a terrible history of abuse and arrived at school having been raped a number of times by her father. He is now in jail. Her mother became a prostitute and is very sick and not expected to live long. Her grandmother is responsible for her but cannot help much. She has been so traumatized that she has struggled at school from the time she came but she has started to improve. The Ministry of Education is pleased with the rehabilitation that has taken place and the signs of increased interest in life and education. She is now a lot happier and plays and smiles with the other children.